The City of Harlingen and the Harlingen Consolidated Independent School District have joined forces to provide the community with three all-inclusive playground facilities with structures and features designed to accommodate children of all abilities. Physical play may seem a simple component, yet there are numerous studies on its profound effect on a child’s cognitive, emotional, and social development. City and district officials have collaborated to design playground structures that bring all children together—regardless of physical abilities—in a fun and active environment that promotes exercise and social interaction. 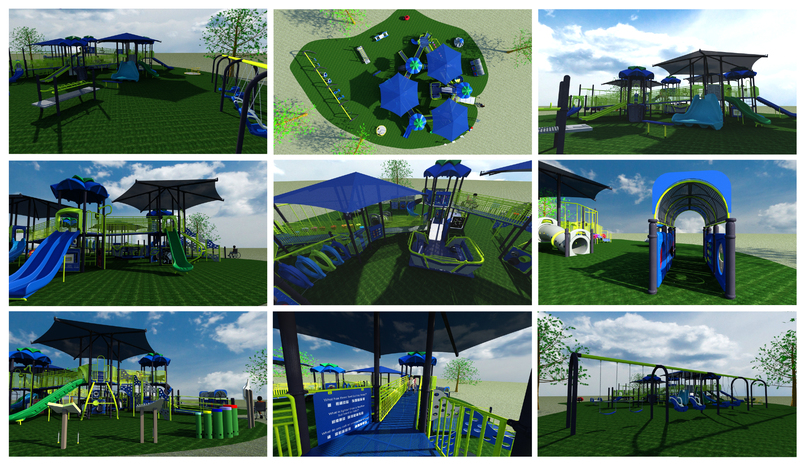 The Lon C. Hill playground will be funded through a $425,000 grant received by the city of Harlingen from the Valley Baptist Legacy Foundation. The Pendleton Park and Victor Park playgrounds will be co-funded by the city and HCISD, both of which have agreed to fund a total of $400,000 each for both playgrounds. The district’s TRE funds will make this joint partnership possible. HCISD will incorporate the use of these playgrounds into the curriculum for special needs students. After visiting all-inclusive playgrounds in neighboring cities, the design committee identified the most vital feature needed is the space itself to accommodate the physical needs of handicapped visitors. Students with disabilities such as cerebral palsy and spina bifida who require a mobility device to move around will have pathways and transfer points that exceed ADA standards, enabling them to move more freely in the play spaces. The playgrounds will have ample nooks and niches within the main play structures for students to momentarily recharge as needed. A 5-foot walkway connecting the various structures and activity pods within the playground will provide sufficient space for a walker, wheelchair, or an additional person. The inclusive approach will alleviate some limitations for approximately 1,800 of the district’s special needs students, including 363 students with severe handicaps in life skills programs across multiple grade levels. The playgrounds will create an environment fostering a feeling of success as students interact on the same level as their peers. Construction at Lon C. Hill will begin mid-January, with the two additional playgrounds following immediately after. All three playgrounds are projected to be completed by the end of March 2017.